Perhaps one of the best breakfasts I’ve had in as a vegan (perhaps in my life even) was at Madeline’s Bistro. Though I’d heard about this little restaurant in Tarzana as being the only real gourmet vegan restaurants in the Los Angeles area, it took me ages to finally go there. Finally, one Saturday when Shawn and I had to make a trip out to the far reaches of the west valley, we made Madeline’s our breakfast destination. The thing that enticed me the most was the promise of vegan beignets. Beignets are a rare treat on their own, but I’d never even heard of a vegan version. I had to have them. Of course I was not disappointed. The beignets were crunchy on the outside but fluffy on the inside. Instead of being covered in the standard powdered sugar, they came with a fruit compote. They were amazing. 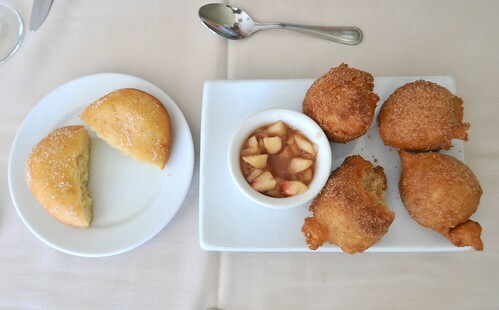 I could write this whole post just about those beignets. I wish I wasn’t writing this right now because now I want to go eat them. Ok, moving on. We also got the donut which was equally as satisfying. Without a doubt the best vegan donut I’ve ever had, soft and fluffy and delicately sweet. Shawn ordered the chicken and waffles. Luckily I got to sample some. The chicken was a breaded seitan that was to die for. Again, quite possibly the best seitan I’ve ever had in my life. It was perfectly seasoned and well matched with the potatoes and gravy. The Belgian waffles were thick and crunchy. They definitely had a healthier taste to them with a nutty, grainy flavor. I ordered the porcini-crusted tofu benedict since I am obsessed with vegan benedict. This was a pure delicacy. The hollandaise was lightly flavored and the whole thing was perfectly seasoned. It was an amazing combination of vegetables and tofu with just enough sauce to compliment the dish without overwhelming it. In other words, it was amazing. I really was so impressed with everything that we had. If you’re going to try Madeline’s, you must go for brunch. It’s honestly not that far from where we live, but just far enough that we pretty much only go for special occasions, which is perfect. Wow, this looks so good. Your photos are gorgeous, too! it was SO good. and thank you. i regret writing this because now i want beignets so bad i may go insane. I love that benedict and their donuts are absolutely the best vegan donuts I’ve had, too! I prefer the donuts to the beignets, but that’s just me, and the faux chicken and waffles is quite the indulgence! WOW! 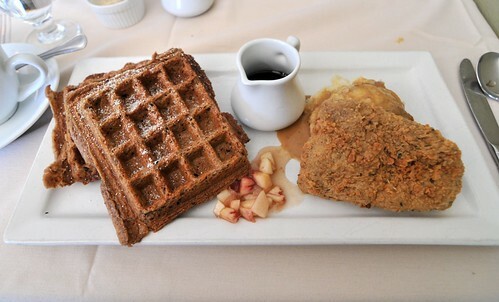 That really looks amazing, I can’t decide which dish I’d rather have…the chicken and waffles (that seitan looks perfect!) 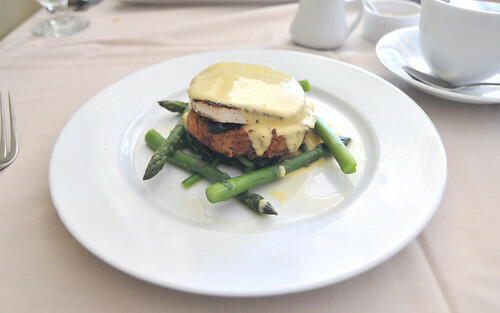 or that oh so tender and saucy looking tofu benedict. Eh, I would just order both. You ordered all my favorite things! The beignets and benedict are the best! I love that Studiodrome takes photos for you – Ryan takes mine too. When you have a film maker at your disposal to take great shots, you kinda have to use it! Yummy! The tofu benedict is my dream. !!!!!! I want to go to LA just for that brunch! I now have a destination location should I ever find myself in the LA area. Hey, it could happen. Wow wonderful! Donuts and beignets are two of my favourite food. I wish we had a place around with vegan versions of these. You are so lucky!